I was on my way to a factory outside of Shenzhen, a city of 14 million people mostly dedicated to the manufacture of the things we buy. If it beeps, makes phone calls, or increasingly, if you can wear it, it’s probably come from out here. We roll through the city to the outskirts and then onto a wide five-lane highway that rolls up through the smog, past rocks and hills that look like a stage set for a Kung Fu fable. This is modern China, a place of conflicting images and a world of untrammeled growth. The factories are about forty minutes outside of town in a special economic area dedicated to commerce. Sadly, the smoke from the endless stream of cars and trucks heading back and forth from the manufacturing center along with whatever is coming out of the factories themselves casts a pall on the landscape; little can be done about that right now, though. Motorcycles are outlawed here for safety and environmental reasons, and if this van is indicative of the current state of repair of many work vehicles, it’s going to take a long time to scrub this city’s skies clean again. Most of this most recent smog comes thanks to this chilly November. People outside of town – and in – are burning wood. It won’t get clear again until the Spring and then the Summer will bring idling cars, their air conditioners cranked up in the heat. We trundle along into the economic zone, down long roads lined with people returning from work. We narrowly miss a man on a bike and we pass electric cycles carrying huge, heavy loads of plastic and other scrap. This zone is where the factory workers live and raise families. There are no street lights and I see children meeting their parents after work, silhouetted by the lights of a stream of cars. We pull into a guarded complex of smaller factories. The man I’m here to see runs a company that makes USB keys. I probably have twenty of his products, all of them given to me by PR people, in a jar at home and don’t even know it. He has clients all over the world and most don’t even know they’re doing business with him. A chain of distributors come to him to make the finished product. When people say “OEM,” this is who they’re talking about. I climb up the dark stairway into a wood-paneled office area where sales and marketing people sit. I sit down with the president who offers me a water and a cigarette. He shows me his new selection of LED lights: he’s coming in on the ground floor with these just as compact fluorescents are leaving the realm of the profitable and moving into the commodity. He’s betting on these new lights to take him through the next decade. He’s been doing this for about seven years. He used to work in integrated circuits but he bought a few used Japanese PCB manufacturing machines and started making devices for clients. He stuck with USB keys because it’s a steady market and he lives comfortably. We walk into the factory. This is no “Intel Inside” clean room. A dozen long benches run through the room. There are ten old Dells with CRT monitors for quality control and a line of soldering irons at the ready. It’s late – about 6pm – so everyone is home. During the day the factory is full of people. All of them are making USB keys and the company can punch out about 30,000 a day, a minuscule number compared to the capacity of the behemoths down the road. The keys start out as circuit boards. There are about five keys per board and they come already milled to specifications. One employee lays down a layer of solder and puts the board through to the SMT machine. SMT stands for surface mount technology; it’s a way to tell a robot how and where to place resistors, transistors, and capacitors on a board. The machines here are old. They still use 3.5″ floppies to program them and they’re all in Japanese. They cost about $100,000 each, now, used. The better ones can hit the $1 million mark. 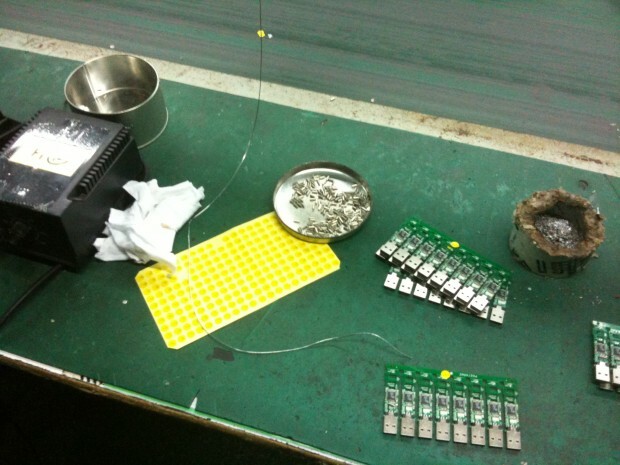 The first SMT machine grabs tiny components from a long reel of electronic parts. It’s a mad dance. The hand – a box with pistons, really – picks the part and then places it. Pick, place, pick, place. It takes about a minute to do a set of five. Another employee checks the work and then it moves on. There’s plenty of room of error here simply because this is a commodity. The machine breaks down, it places transistors a bit skew. It doesn’t matter. In the end it’s going to hold whatever data you put on it, at least for a while. The dead devices go back into the recycling bin. The second SMT places the IC chips, the controllers and the memory. 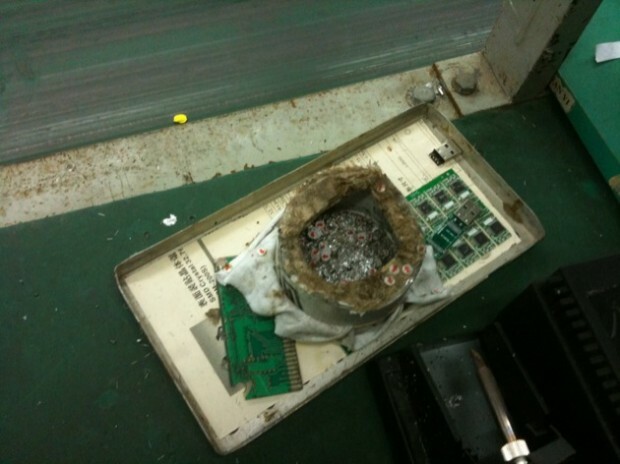 A final employee spot checks the board and sends it out to the soldering line. There they solder on each USB port by hand. The PCB itself costs maybe 50 cents to manufacture – that’s only parts – but the IC and the memory add about three dollars more. In the end, you’re looking at about $5 in costs, including labor. The final step is the application, by hand, of the silk screen, embossing, or laser etching. Each piece. By hand. The margin is slim at best, especially considering distributors sell these things to customers for about $7. So is this a place of horror? No. This is where men and women are given a wage and living quarters to make USB keys. There are few amenities here, no child care, no donuts at lunch. The toilets are squat toilets; the sinks are overflowing into the bathroom. The lockers are six inches by six inches. Enough for shoes, maybe, and a jacket. But this is how this stuff is made. Bigger companies won’t touch these orders – a run of 1000 pieces to them isn’t even worth the energy it takes to start up the machines. This factory fills a hole in the market. The employer fills a hole in the employee’s life. The employee lives in a free house and comes to a steady job. It’s hard, to be sure, and it’s a mess — but it’s a living. We moved our manufacturing over here. That’s what happened. To say this is good or bad, positive or negative, is not my place. The employees here are content and the owner has a nice car and is planning a vacation to the US next year. On a micro scale, this is what countless small businesses have done all over the world for about two centuries. You fill a need. You fill an order. On the macro scale you can cry and moan about exploitation, pollution, and capitalism. Pittsburgh was probably once as dirty as Shenzhen is right now. Blue laws were put into place there early on to prevent desolate employees from drinking themselves into an oblivion. We changed, and China will change. My fear, however, is that we’ve become inured to the way things are made here. We love how our phones spring to life a touch of a button. We love how we can buy a terabyte of disk space for $100. We love how Moore’s law is always punching something new across the transom. But consumption clouds the true value of this stuff. We need to rethink what we buy and expect more from the companies that try to sell it to us. This is a mom and pop USB factory. Someone like Foxconn, manufacturers of the iPhone, are a different animal entirely. But both are part of the menagerie that is Chinese manufacturing. It’s globalized. It’s monstrous. It caused this smoke and this darkness and this mind-numbing work. Don’t be fooled by clean rooms and white walls you see on TV with magical robot arms carrying iPhones into the heavens. This is dirty work and it will get dirtier. This is an industrial process to fulfill our desire. Shenzhen, and this small factory on her outskirts, show us the price of that desire.